Jawaharlal Nehru University authorities have held 15 students, most of them from socially disadvantaged backgrounds (Dalits and OBCs), guilty of indiscipline for protesting against seat cuts in research courses and the rule making interviews the sole determinant of selection. The students, who had arrived to meet vice-chancellor M. Jagadesh Kumar in February this year, have been indicted for “unauthorisedly” sitting in the committee room while waiting for the Vice Chancellor. A proctorial committee found them ‘guilty of indiscipline’. The indicted students are Anubhuti Agnes Bara, Anubhuti Sharma, Aparajitha Raja, Asif Kv, Birendra Kumar, Dawa Sherpa, Dileep Yadav, Manmeet Randhawa, Mulayam Singh, Pallikonda Manikanta, Prashant Nihal, Shakeel Anjum, Somaya Gupta, Sumeet Samos and Thallapelli Praveen. One of the students said they faced possible expulsion and fines and had been issued showcause notices asking them to respond by Wednesday. The students, he added, were protesting for a genuine reason and for the cause of social justice. 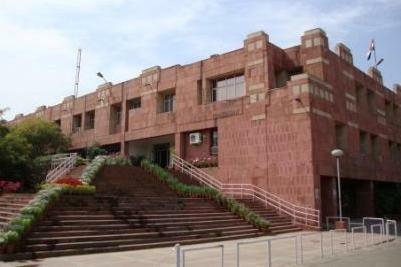 JNU has adopted higher education regulator UGC’s new MPhil and PhD regulations, limiting the number of research students a teacher can guide. This has reduced the number of research seats. The regulations also give 100 per cent weightage to an oral interview, making it the sole factor deciding the admission of research students. Students from deprived sections have been pointing out that candidates from backward castes faced discrimination in such interviews. Give the fact that discrimination on the basis of caste is still an ugly fact, this 100 percent weightage to an oral interview does leave scope for allegations of unfairness. The students said they would protest the findings of the proctorial panel.